We all have our own unique characteristics that make us who we are. Everyone has both positive and negative personality traits and that is what makes us human. But how we carry ourselves reveals a lot about our character and it also determines the way others see us, too. 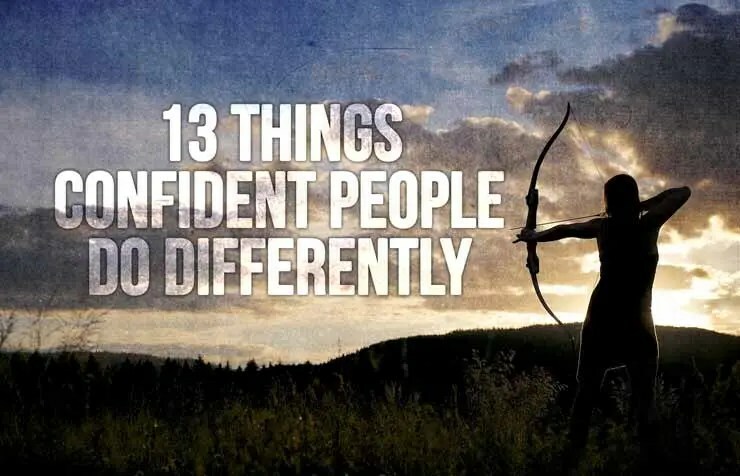 If you are feeling like you need a little confidence boost, read the following list of 13 things, some of which(or all) truly confident people do in a different manner than people who lack faith in themselves. It will give you the opportunity to view things from a different angle or even ideas on how to improve your own confidence. Fear lies in every person’s mind. It is something we need in order to grow and we can grow only by overcoming our fears and not letting them dictate our decisions in life. The people who have strong faith in themselves understand that, and they don’t let their fears deprive them from what they truly want to achieve. Highly confident people are usually really ambitious. They don’t let difficulties get in the way to their goals. That is why they handle their problems with creativity, a strong mindset and, they do not quit easily and rarely lose their time in complaints about their setbacks simply because they are too busy working on the solutions. What many people have in common is putting off the work they should do today for tomorrow just because they don’t “feel like it”. The truth is that waiting for the “perfect” moment can keep you waiting forever. Confident people don’t believe in the story of the “right circumstances” that so many people tell themselves and they most probably know that this story is told by people with a fear of change. It is hard to break old habits and build new healthier ones because it takes hard work and dedication- traits typical for strong minded-people. It has always been easy to come up with an excuse for something you simply don’t want to do or haven’t been committed enough to do it. You won’t see highly confident people sitting around and complaining about the traffic on the way to work, or their lack of free time to take care of themselves. They understand that if you don’t like where you are right now, you can change it by working on your attitude and the way you respond to a problem. Complaining and excuses won’t get you far. Highly confident people know who they are, where they lack knowledge, what strengths they have, what they should be working on in order to become stronger versions of themselves. They simply respect themselves and appreciate who they are. That is why they treat other people the same way- with respect and appreciation, rather than jealousy and judging. You won’t see a truly confident person talk behind someone’s back, gossip or being hateful towards someone. It is what weak people do, it is what people who look down on others do. Many of us catch ourselves being stuck in a place that is commonly known as “the comfort zone”. It is a tricky place to be because it may make you feel at ease and comfortable, but in reality it doesn’t help you evolve in any way. Really confident people are individuals who love to upgrade themselves on higher and higher levels and they know that falling in the trap of your comfort can stop your growth. That is why they are cautious not to fall into it and are always challenging themselves to DO more in order to BECOME more. People with high confidence know that in life they are going to meet people that they might not get along with. And they are fine with that. Understanding that you cannot please everyone you meet can save you some time and headaches. Confident people prefer keeping their focus on the strong relationships in their life and expressing gratitude for what they already have. Highly confident people handle other people’s negativity in a different way than others. They simply don’t focus their mind on it for too long. When they are given negative feedback or hateful comments, they try to understand where the person’s opinion is coming from and respect it, but they never concentrate on it for too much time. Confident people understand that there aren’t two people on the planet who agree on every single topic and appreciate the diversity in opinions and viewpoints. Truly confident people understand that sometimes in life things don’t work out the way we wanted them to. That doesn’t necessarily mean that life is awful. Confident people chose to keep their attention on the positive aspects in situations like this because they may not always have control over the circumstances, but always do over their attitude towards them. Sometimes we tend to ignore problems with the hope they will magically disappear or simply because we don’t want to deal with them at that particular moment. Confident people know that this is a risky thing to do because when problems aren’t being worked on, they can evolve into more serious ones. For example, when having an issue with your partner, postponing the important discussion can leave you both losing trust in each other or losing your sense of communication. That is why problems need to be dealt with as soon as possible. Facing the ugly truth may be a hard thing to do but it will save you some serious headaches and heartaches in the long turn. People with genuine confidence believe in the uniqueness of all individuals. They love to see the diversity of people. That is why they don’t compare themselves to anyone. Comparison is unresourceful because two people can never be 100% alike. Each person has his own personal traits- positive and negative. Of course, there are people who confident people look up to and find inspiring but they know that aiming to be better than who you were yesterday is a more resourceful place to come from in order to improve rather than constant comparison. Highly confident people don’t accept blindly everything they read or hear. They prefer to double-check the information for themselves. It is an important thing to understand that failing is not necessarily a bad thing. Confident people believe in that because they believe in second chances. Everybody deserves to be better than they were before. They also believe that failing is an inevitable part of life through which people can evolve only if they are cautious enough to realize the lessons life has given them.